Track captain Erica Phiansunthon '17 appreciates the continuity of track and field, a sport in which almost everyone on the team signs on for winter and spring seasons, and many of the runners undertake cross country in the fall as well. "We are all really close," Phiansunthon says, "and competing together for two or more seasons also gives us more time to work with our coaches and improve our form." In her own case, the senior shot-putter, credits the coaches with helping her add nearly six feet to her throwing distance this winter. Phiansunthon’s season included a win at the Prep B Championship and third place in the group championships, which qualified her to compete in the Meet of Champions. 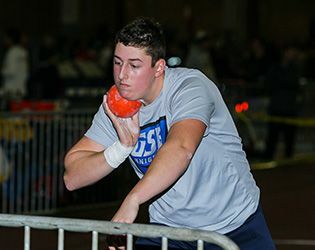 In boys’ shot put, junior C.J. Licata dominated the sport, winning six meets and placing third in the Meet of Champions. While not all of the runners and throwers earned medals this season, many achieved personal bests, including several of the team’s freshmen—a fact that bodes well for the future of the program. Because weather limits winter track to a handful of big indoor meets, the athletes look forward to the spring, when there are more meets and competition tends to be closer to home. This spring, look for continued success from Phiansunthon and Licata and for significant contributions from senior runner Matt Petit and juniors Bobby D’Angelo, Jackson Ensley and Joe Johnson for the boys, and for the girls’ team: seniors Sammy Bittman and Olivia Wilson and junior Nicole Johnson. In addition, the team’s underclassmen are expected to make increasingly important contributions as the season unfolds.